Vous pouvez également utiliser 30800 Kobo Super Points pour l'obtenir ! Airborne Express, Hershey's, Motorola, Pillsbury-how do the executives of international corporations formulate effective strategies for corporate success? Filled with helpful insights into the state of the art in strategic management, this book provides a framework for the formulation, implementation, and control of strategies for all types of domestic and global organizations. You'll also find 21 suggested corporate cases for analysis (complete with reference sources), including Blockbuster Video, PepsiCo, Harley-Davidson, Nike, Home Depot, and Microsoft. 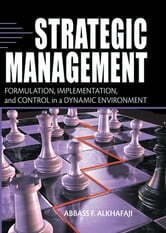 This up-to-date volume gives you a comprehensive overview of strategic management in an easy-to-read format. It addresses important current issues, such as TQM (Total Quality Management), reengineering, benchmarking, and the formulation of strategic management in international markets. Strategic Management: Formulation, Implementation, and Control in a Dynamic Environment is a part of The Haworth Press, Inc. promotion book series edited by Richard Alan Nelson, Ph.D., APR. Strategic Management: Formulation, Implementation, and Control in a Dynamic Environment is an ideal reference for any teacher, student, or professional in the management arena.